Fred and Emma (Stube) Wiese, ca. 1900; digital image 2010, privately held by Melanie Frick, 2014. 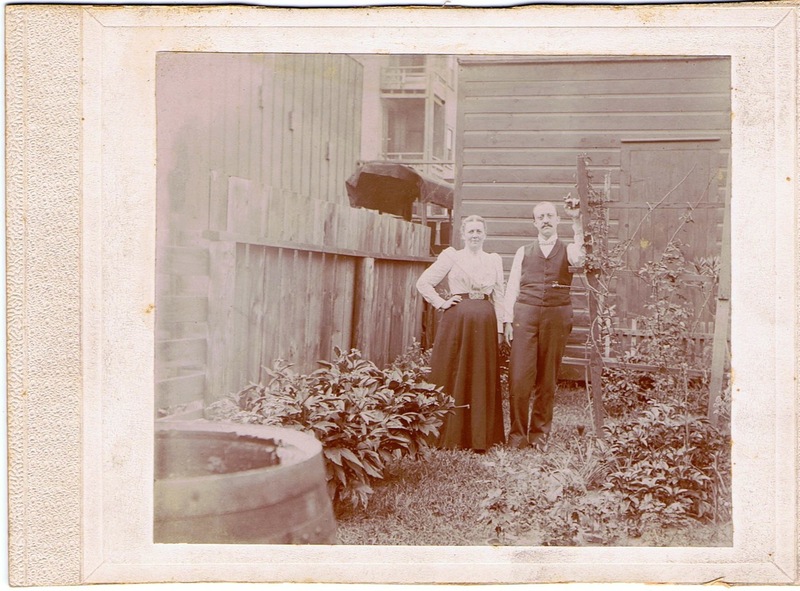 This glimpse into a backyard garden at the turn of the twentieth century features Fred and Emma (Stube) Wiese of Chicago, Cook County, Illinois. Fred rests his hand on a trellis while Emma stands close by his side, her hand on her hip. Their arms barely brush together as they gaze directly at the camera. The photograph, pasted on an embossed white card, is clear and of good quality, despite the fact that it is a seemingly casual shot. Might it have been taken by a traveling photographer who passed through the neighborhood, offering his services? Fred and Emma are not dressed in their best, although their simple attire was certainly presentable enough for a photograph. Perhaps their urban garden was a source of pride, making it an ideal spot for the couple to pose together. 1 1910 U.S. census, Cook County, Illinois, population schedule, Chicago Ward 27, enumeration district (ED) 1184, sheet 15-B, p. 9451 (handwritten), dwelling 254, family 306, Emma Wiese; digital image, Ancestry.com (http://www.ancestry.com : accessed 6 February 2014), citing National Archives microfilm publication T624, roll 270. 2 Joan Severa, Dressed for the Photographer: Ordinary Americans and Fashion, 1840-1900 (Kent, Ohio: Kent State University Press, 1997), 459. 3 1910 U.S. census, Cook County, Illinois, population schedule, Chicago Ward 27, enumeration district (ED) 1184, sheet 15-B, p. 9451 (handwritten), dwelling 254, family 306, Leonard Wiese; digital image, Ancestry.com (http://www.ancestry.com : accessed 6 February 2014), citing National Archives microfilm publication T624, roll 270. 4 1900 U.S. census, Cook County, Illinois, population schedule, Chicago Ward 14, enumeration district (ED) 453, sheet 9-A, p. 320 (stamped), dwelling 64, family 164, Fred Wiese; digital image, Ancestry.com (http://www.ancestry.com : accessed 6 February 2014), citing National Archives microfilm publication T623, roll 623. 5 Severa, Dressed for the Photographer, 472. This entry was posted in Photograph Analysis and tagged 1890s, 1900s, Chicago, family history, genealogy, Illinois, Stübe, Wiese on February 7, 2014 by Melanie Frick. Thank you, Kim! I agree that the style of the photograph seems very natural and gives a much better feel for the couple than the typical studio portrait might have. Thanks for stopping by! i wonder if that is their rain barrel in the lower left of the photo. Good catch – I’ll bet that’s what it was!